To receive the book and doll set by December 1st, orders must be placed by November 20th. In years past we have done the Elf on the Shelf with the girls. But, each year when the holidays rolled around and I took their elf out of hiding to start leaving around the house for them to find each day, I wondered if there would ever be a doll/book set that would come that stood for the real meaning of Christmas...celebrating the birth of Jesus. So, when I recently heard about the new faith based The Shepherd’s Treasure book/doll set, I couldn't wait to get my hands on a copy and start a new tradition with the girls that didn't include the crazy elf pulling pranks or hiding on them, without any real meaning and reason behind it. Have you heard about the The Shepherd’s Treasure? If not, and you have been hoping for a faith-based doll/book set to share with your children at Christmas instead of the Elf on the Shelf, then you have to check this new interactive set that is sure to be a hit with your family this Christmas, and for years to come. "The Shepherd’s Treasure is a new, interactive family tradition that helps children find the TRUE meaning of Christmas! On the first day of December, your Shepherd will appear and your family adventure will begin! Your Shepherd will travel by night throughout the month in search of Jesus. Each morning, your children will find him in a different place (and maybe even doing a different activity) in your home. The Shepherd’s Treasure Advent Cards correspond with fun activities the Shepherd can do throughout the month. Each card features a Bible verse and message from the Shepherd! Little ones will follow behind their Shepherd along his journey. Then, on Christmas morning, your children will find their Shepherd kneeling before the greatest Treasure of all time: Jesus! The search doesn’t stop there though! My prayer is that this fun treasure hunt will result in a more lasting search to find Jesus every day!" This is just what I was looking for to share with my girls. And, come Dec. 1st, our new family tradition with the little shepherd boy will begin. I can't wait! While I know my girls will be saddened to not be getting a visit from their elf, I know that once they are reminded about the real reason we celebrate Christmas and how the The Shepherd’s Treasure doll/book set will help us celebrate Jesus' birth, they will be all for waking each morning to find the Shepherd and completing the activities on the advent cards with their seasonal Shepherd friend. I can't wait to hear what your family thinks of the new faith-based Christmas tradition, The Shepherd’s Treasure, which families like mine will be starting on Dec. 1st, as we count down until Christmas Day. All through December, people will be sharing their shepherd boy quest pics with hashtags #spottheshepherd #theshepherdstreasure and we will choose the top FOUR most creative photos for fans to then vote on to determine the winner! Winner receives $500 - $250 for them and $250 donated to their church! This contest is lots of fun, but the best part about it is we are bringing back the true meaning of Christmas and teaching our kids that it's not all about receiving gifts and behaving well just to receive material things. Join us in the fun! Step 1: Order The Shepherd's Treasure book with doll set (and advent cards if you choose) by NOVEMBER 20th to ensure delivery by December 1st. Link to buy in comments. Step 2 (optional): Get your church involved - The more people from your church who participate in the contest, the bigger the chance to win! Just send people to The Shepherd's Treasure Facebook page for details. Step 3: Make sure to LIKE @BLOGGERSPAGE and @The Shepherd's Treasure Facebook page to receive contest next steps on December 1st! 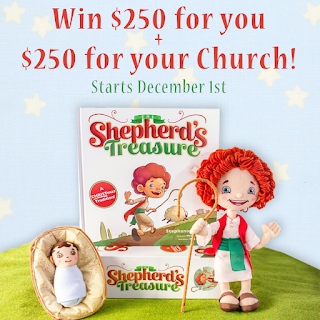 I am excited to be able to offer one lucky Inspired by Savannah reader the chance to win a Shepherd's Treasure Book/Doll Set to share with their family. To enter this 24-hour flash giveaway, please complete then entries on the Rafflecopter form below. Good luck! Note: In order to participate in this giveaway for a free Shepherd’s Treasure, you must like The Shepherd’s Treasure Facebook page https://www.facebook.com/shepherdstreasure/, share the Facebook page and leave a comment in the raffle section about what they are excited about this Christmas.